Bohemia has long been associated with the making of fine crystal and glassware, and one of its finest exponents is Moser, founded in 1893 and based in the famous, picturesque spa town of Karlovy Vary, 130 km (81.25 miles) west of Prague. Traditionally made according to a secret formula, Moser glass is renowned for its intense, jewel-like colors and is created by hand in the factory – which is open for tours – using eco-friendly lead-free crystal. Glassblowers hand their skills on from generation to generation and in all it takes up to ten years to become expert in hand shaping and blowing the glass while working alongside furnaces heated to 1,200°C. Elegant Moser glassware graces Royal tables and Is used in the making of the awards for the Karlovy Vary International Film Festival, held each year in July. Fine examples of the craft, from sapphire-blue flower vases to delicately gilded wine goblets, are beautifully displayed in the new Moser Museum, which offers multimedia accounts of the company’s long history while celebrating more than 120 years of glass-blowing talent. A sales gallery allows visitors to purchase Moser glassware and the café terrace is a pleasant summer spot for coffee and cake amid sparkling crystal sculptures and splashing fountains. Kpt. Jarose 46/19, Karlovy Vary. Opening hours: museum daily 9am–5pm; glassworks daily 9am–2.30pm. Admission museum: adults CZK 80, students CZK 50, family CZK 180; glassworks adults CZK 120, students CZK 70, family CZK 260; combined ticket adults CZK 180, students CZK 100, family CZK 390. Karlovy Vary is west of Prague and best accessed by car in under two hours along the E48. Explore northern Bohemia and all its riches on this private guided tour from Prague. Discover the ruins of a castle, tour of the most renowned crystal factories, and, in the spa town Karlovy Vary, walk around the Jan Becher Museum, dedicated to Becherlovka, a delicious Czech digestif that is made up of a secret concoction of herbs. Sample the delights of the world-famous spa town of Karlovy Vary on this full-day trip from Prague, including a delicious lunch. Admire the Bohemian landscapes as you travel by coach from Prague to Karlovy Vary, and discover the many attractions of the town, sometimes known by the German name of Karlsbad or Carlsbad. Visit the Moser glass factory, where beautiful crystal ware is made; admire the elegant spa colonnades and fountains, and sample some of the reputedly curative waters, light spa wafers and some of Karlovy’s legendary herbal liqueur. Set your eyes on the beauty of Karlovy Vary, an enchanting spa town located outside of Prague. 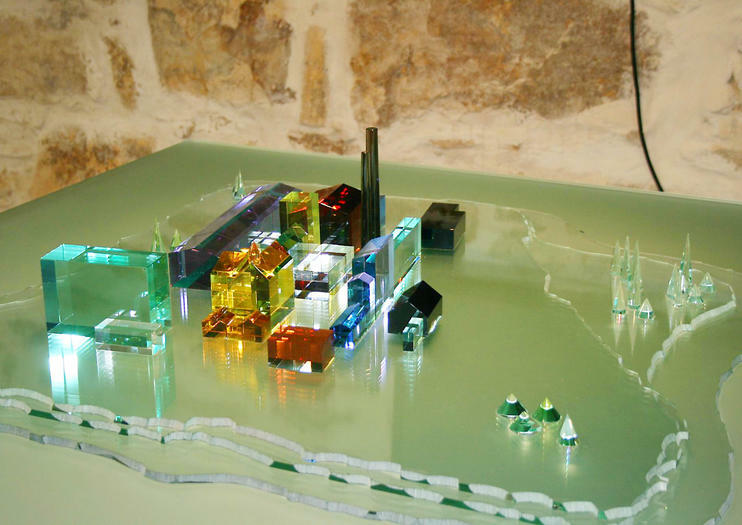 This guided day trip includes admission to the Moser glass factory and museum for a look at exquisite glassworks. Learn about the historical significance of the town's mineral springs and stroll the promenade on a walk through the city center. Lunch and shopping are included along with round-trip transport. Visit the spa town of Karlovy Vary on this private full-day tour from Prague and explore the city both with and without your guide. Tour the famous Moser crystal factory, see the Grand Hotel Pupp where James Bond movie Casino Royale was filmed, stroll along the scenic Teplá riverfront, or ride the cable car to the Diana Observation Tower for a magnificent view over the city. The world-famous spa in the western countryside of Czechia hosted kings, caesars, composers (W. A. Mozart) but also movie stars such as M. Freeman, A. Banderas and M. Gibson. You can also become one of the guests who has walked on the colonnades and tasted healing mineral water springs. Enjoy also local wafers, herbal liqueur Becherovka or visit world-known Moser glassworks on a comfortable private countryside trip ALL-INCLUSIVE with lunch and admission.